Is your Business Branded with Professional Headshots? A current, stylish, and high quality headshot is not only useful for the prospective actor or actress trying to make it in the entertainment industry. Headshots are also a valuable tool and resource to have as a working professional, entrepreneur, or CEO. In the business world, a carefully chosen headshot is a crucial part in publicly representing yourself and your brand. The following are reasons to keep an up-to-date headshot as a working professional. 1. It keeps your business looking fresh and relevant! Consumers and clients can easily tell if a headshot of a CEO or head of a business they are working with is dated or not. As the person in charge, you may prefer the headshot or glamour photo of yourself from 20 years ago when you first started your business, but, it will give clients and customers the idea that you are not forward thinking or relevant. So do yourself a favor and avoid this faux pas. Your website should have photos that are up-to-date and modern looking. In fact, it would be best to change them every one to two years, or anytime the CEO or staff's looks have greatly changed. On the plus side, some wrinkles and gray hairs add character and can be an indicator of the blood, sweat, and tears you have poured into building your business into the success it is today. So do yourself a favor and visit a headshot studio today! 2. It is an excellent way to market your business! Not only does a current headshot keep a business looking relevant and fresh, a headshot also serves as a valuable and inexpensive way to market and promote a business and its representatives. We live in a society that has our noses buried in our electronic devices. Go out to a restaurant and you are bound to see people at the tables around you staring at their phones, not focusing on their present company. However, face-to-face communication can be a refreshing and essential way to get customers and personalize a business today. Especially in the world of freelance. Freelance bloggers, web developers, artists, etc. can benefit greatly by including a headshot on their business card or website. It allows potential customers to get an idea of the whole package they will be ordering, you included! 3. It gives your business an extra touch of professionalism! They say the devil is in the details. Too often unfortunately, taking the time to pay attention to details is ignored. Adding the personal touch of a high-quality headshot(s) to your company's website will impress customers, and create an impression of status and success among your competitors. A professional profile image is especially beneficial for companies that utilize social media. Clients will be more willing to network with you on social media if you show the real you, instead of having your business' generic and boring logo or sporting a clip art image. Headshots show the faces of an organization -- and its brand image -- to the world. In addition, changing headshots during different times of the season can show a lighter side to your business, for example, as a company you may decide to get pictures taken of the staff or board wearing Halloween costumes for the month of October. This can demonstrate that your company is not only professional, but fun, which is an attractive quality to most clients. Now that you know all of the benefits that go into having professional headshots created for your business you may be thinking about doing it yourself. After all, your smart phone has a decent camera. How hard can it be to get a quality photo? In fact, you would be surprised at how difficult it can be. So instead of taking the gamble of doing it yourself, hire a professional headshot photographer today. They will have the equipment to light, capture, and create the perfect ambiance for your headshot. They will also know how to make you look great while capturing your true essence. Invest in some high quality headshots for your company today, and reap the rewards tomorrow! 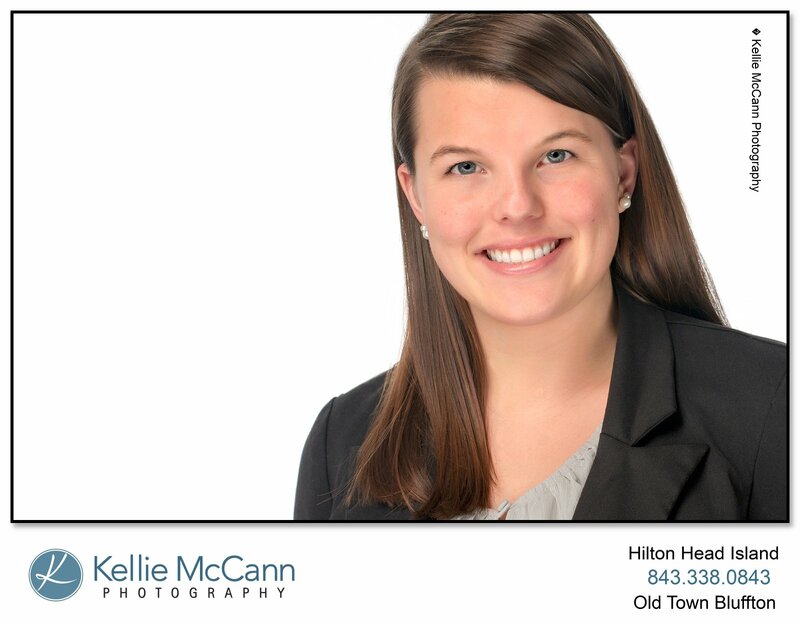 "Kellie McCann was very professional. The pictures turned out wonderful and she made sure we went through every photo taken to chose the pictures we liked the best. She gave helpful advice when we were discussing which poses would look better on certain types of advertising. We had such a fun time while having our pictures made. Kellie is a very engaging person and the whole experience was just positive and entertaining." Bluffton Headshots photographer, Savannah Headshots Photographer, Hilton Head Photographer, Kellie McCann specializes in Headshots, family portraits, high school senior portraits and children’s portraits.